Goal Statement: "To invite the listener to marinate in the presence of a Holy God, both Teacher and Friend." Major Theme: 1 John 4:19 - We love because He first loved us. With the exception of YOU'VE GOT A FRIEND (Carole King - 1971), Cheri Keaggy wrote all of the compositions and lyrics, @2007. Experienced Producer: Tom Hemby - All the instruments in STAY TO THE MIDDLE & YOU'VE GOT A FRIEND, the guitars in nine of the songs, and the harmonica in NOW I CAN SING. Ron Hemby - Played bass and did back up vocals. Phil Keaggy - An electric guitar solo and guitar support in THIS IS THE LOVE. Cheri Keaggy - Piano in THE REASON I STAND TALL. Looking for upbeat, spirit-raising, contemporary pop / piano-based, refreshing and memorable melodies? Heart-felt vocals which comfort and uplift? Compositions paired with lyrical messages which inspire faith & discipleship, and give hope with the promises of the Lord? Cheri Keaggy's album, BECAUSE HE FIRST LOVED US more than fits the bill and is the album to enjoy, listen to and soak into one's being. For, BECAUSE HE FIRST LOVE US is a MUST HAVE musical gem, which is a fun and entertaining way to keep a positive attitude about bumps in the road of life, strengthen personal resolve to depend on the Lord in facing life's mountains, and encourage one's faith walk with a loving Lord! 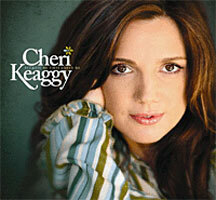 Cheri Keaggy's CD, BECAUSE HE FIRST LOVED US is this reviewer's favorite Contemporary pop/piano-based Christian music album of 2007; a gem missed by all the 2008 Christian music award shows. This collection of songs has all the qualities in spades which make both the listening experience not only very entertaining musically, but also feeds & uplifts one's soul, inspiring the listener's own faith and trust in the Lord, as a loving Father, ever faithful to his children. Not many CDs on the market offer such a delightful and inspiring combination of musical components found in this varied collection of songs. The quality and dynamic mix of vocals, melodies, well done musical accompaniment, musical delivery and lyrical messages are truly on a level of Christian music which calls the listener "to marinate in the presence of a Holy God, both Teacher and Friend." Cheri Keaggy, inspired by the Holy Spirit, has combined her considerable musical gifts of songwriting and vocal talent with spiritual lyrics, which are inspired by her own walk with the Lord, sharing with the listener her spiritual revelations she expereinced during the past five years of her own spiritual journey. During this time period, when she took a break from making albums, Cheri focused on her relationships with both the Lord and her own family, evolving as a practicing Christian who not only walks the talk, but also has grown closer to Jesus in her walk with Him. Both are powerful developments which flow through her contemporary pop / piano and acoustic-based songs, found on this album, BECAUSE HE FIRST LOVED US. The stars of these songs are the vocals, lyrical messages, and irresistible, memorable melodies which Cheri so effectively presents through her vocals, and well done musical accompaniments, bringing a positive energy and an effective testimony to her own faith in the Lord, which flows throughout the songs presented in this album. The combination of such meaningful lyrics which so wonderfully express the spiritual truths combined with her professional, inspiring vocals and the perfect melody which she wrote for each song, are truly a blessing to the listener, no matter the mood or circumstances of one's life. Besides having a soothing, yet strong voice, great diction and breath control, her vocal performances are dynamic, joyful (RAIN OR SHINE * NOW I CAN SING * SPEAK), full of the Spirit and from the heart, (BECAUSE HE FIRST LOVES US * RESTORED * YOU'LL ALWAYS BE MY SON), sung with a dynamic energy, (THIS IS THE LOVE * YOU'VE GOT A FRIEND), which transcends the listeners feelings of discouragement, offering spiritual hope and a boost of positive faith (STAY TO THE MIDDLE * THE REASON I STAND TALL * TELL ME AGAIN ABOUT HEAVEN), for one's perceptions, and offering something to hang onto and depend on; the love, faithfulness and mercy of Jesus (BRING IT ALL IN, THE CROSS OF CHRIST, THIS IS THE LOVE * NOW I CAN SING). What can I say about her inspiring, delightful-poignant melodies? They are written mostly in major keys, with some minor key influences in some cuts, in a variety of meters (4/4, 3/4 & 6/8), with some great modulations and melody changes in some of the Bridge segments or final run through of the choruses of some songs. Everyone of the cuts on this album uniquely offers a melody and a spirit which is the perfect musical vehicle for each spiritual message presented. What is equally delightful is how these piano-composed songs are brought to life with such solid yet delicate ensemble accompaniments, provided by acoustic and electric guitars, string ensemble, piano, keyboards, a harmonica, woodwinds (flute, clarinet & oboe) and drums /percussion. Cheri Keaggy worked with some talented folks to make it all happen! Musical talent and production values can make or break the success of an album. Not only does this collection of songs have dynamic vocals, melodies and meaningful spiritual messages, which work together so well to present high quality Christian music, but also have quite a team of musicians, performing the always interesting musical intros and accompaniments, talented producers, Eddie Keaggy and Tom Hemby, overseeing and planning this project, and an expert engineering and sound mixing staff, Dan Dillbeck and Eddie Keaggy. As a result, this collection of songs has splendid musical support as well, contributing an extra kick to make a great album even more special and memorable. As the joy of the Spirit is contagious, the musical accompaniments are equally vivacious, joyous, poignant and dynamic, performed by inspired musicians, feeling the Spirit and having fun expressing their own faith and joy through music. These tracks were recorded and mixed just right, creating wonderful compositions that provide inspiring support to the melodies and vocals, and a most enjoyable musical experience for the listener. Compositions offer a variety of introductions and accompaniments, depending on the needs and spirit of each song. Throughout this collection of songs, the listener can hear a wonderful mix of acoustic ensemble work, acoustic & electric guitar, keys, piano, and some strings here and there. Such musical elements as rhythmic counter melodies, chordal support, and instrument solos add energy, spice and enjoyment to the spirit of each song. Back-up vocals are mixed in on just the right level as well, so that they support and blend with the lead vocals very nicely. Sometimes joyful, upbeat, contemporary Christian pop music accompaniment seems to depend too much on the over produced sounds of an overactive synthesizer, which plays well over the radio, but offers only simple melody support for the vocals and message of the song. BECAUSE HE FIRST LOVED US CD proves that contemporary pop music can offer both; ensemble work with a kick, and the elements of fun, energy, positive joy and inspiring praise, which are greatly appreciated by contemporary Christian pop music lovers, and have broad appeal to other Christian music enthusiasts. In every type of song presented on this album: anthems, ballads, praise songs or hymns, the listener hears instrumental voices that are delicately blended, creating a dynamic accompaniment, which is both interesting to listen to and absorb. Yet, these song compositions offer a solid foundation musical sound support for the expressive lead and back-up vocals and melody, having all the popular attributes of the contemporary / pop sound: Perky, driving or subtle beat; catchy melody and lyrics; strong vocals; and a spirit of enthusiasm and joy for the Lord. WOW! What a powerful Christian music album! In case you didn't catch on yet, BECAUSE HE FIRST LOVED US was a huge blessing to this reviewer, and will greatly bless music enthusiasts of any genre as well. I had a terrible time figuring out which songs were my favorites; it was like comparing apples to oranges. I finally did come up with a list of my favorites, listed first below, though all of the songs presented would be welcome in any contemporary worship event or service. * * * * + + FAVORITES OF THIS REVIEWER: Songs which are especially comforting and spiritually boosting, and musically entertaining with great melodies, enjoyable musical accompaniment and fabulous vocals! RAIN OR SHINE FRIEND * NOW I CAN SING (Zesty Praise and Worship Songs) * RESTORED (Lively, joyful, Piano Testimony Ballad) * STAY TO THE MIDDLE (Acoustic-based Sermon Anthem) * SPEAK (Peppy, enthusiastic Prayer Hymn) * REASON I STAND TALL (Poignant, dynamic Piano Worship Hymn) * THIS IS THE LOVE (Broad, Full-sound Altar Call Anthem) * BECAUSE HE FIRST LOVED US (Poignant Piano, Full-sound worship anthem / petition hymn). * * * * + STRONG FAVORITES: Total musical presentations are inspiring and memorable! THE CROSS OF CHRIST (Testimony Ballad - With broad instrumentation and a touch of Gospel genre elements), & BRING IT ALL IN (Testimony Ballad-Piano and guitars). Both are powerful anthems about what Jesus did for all of us and what He has to offer humanity in this world and the next. Would also be effective altar call songs. YOU'LL ALWAYS BE MY SON is a beautiful piano-string /woodwind ensemble ballad, which is meaningful for parents everywhere, especially those who have seen their children grow up, struggle and suffer, praying for them always. TELL ME AGAIN ABOUT HEAVEN - A song with a swirling feeling, well done musical accompaniment, strong message and upbeat vocals, bringing comfort and encouragement. Lyrics reminds us all that despite what storms, headaches, bumps in the road and tragedies we must endure in this world, a wonderful place in heaven awaits us when we go home to be with the Lord. YOU'VE GOT A FRIEND - An old 1971 chestnut that is well done; featuring an enjoyable vocal duet, comforting message and a solid accoustic accompaniment which rivals the original Carole King recording, done back in the pre-dawn era when I was young. IN DEPTH SONG EVALUATIONS: For those of you who want more details and individual song reviews. I have classified and listed the songs by their spiritual theme, and then added my observations of the music presented in each song, and examples of the lyrics, to give you a taste of the spiritual messages. Spiritual themes revolving around the character, love and mercy of our Lord Jesus. * * * * + + Title Song: BECAUSE HE FIRST LOVED US - (1 John 4:19, Matt 5:16) We are able to show God's love and give to others, because God reached out and loved us first, and is willing to teach us how to do so. MUSICAL NOTES: Beautiful piano ballad which is a contemporary anthem, with a stirring, memorable melody, supported by piano, keyboards and subtle strings in a lovely blend of sound. Begins softly with just the piano and keyboard counter melody work. Easy beat percussion is done just right. Cheri's lead vocals are wonderful and dynamic, and from the heart. Well-done back-up vocals add some umph to the bridge and support to the dynamic lead vocals. * * * * + + NOW I CAN SING - (Psalm 30:11-12, John 15:11) - A spirited praise song of thanksgiving and testimony for what the Lord Jesus did during a time of sorrow and pain. In this thankfulness and joy, a new commitment to ever reflect the Lord's glory is made in the second verse. It is sure to get the listener dancing around the room as well! MUSICAL NOTES: Sure to be a favorite song to lift the spirit! A spirited intro of sharply played, crisp, dotted notes with a touch of snycopation, played with enthusiasm and drive by drums, bass and guitars, piano and keys, gets this infectious, joyous song of praise and thanksgiving off to a roaring start. The effective use of major key to minor key broken chords (slide guitar or other key magic), then back to major key sound in the verses, reflects the meaningful lyrics so well. During verses, energy is maintained by effective, rhythmic counter melody, which cooks along with enthusiasm. Vocals and back-up vocals in the chorus, are fabulous as usual, fulll of joy and spirit! The musical cherry on top has to be the glorious harmonica solo in the interlude, courtesy of Tom Hemby! * * * * YOU'VE GOT A FRIEND -(Psalm 46:1-3 * Isa. 40:28-31 & 41:10) A popular 1971 secular hit for Carole King, this song can be interpreted in a spiritual light as well. It lyrically sums up nicely what a faithful friend we have in Jesus, who is ever present in times of trouble. Perfect song to end this album. MUSICAL NOTES: Well-done, poignant, beautiful, acoustic rendition, courtesy of Tom Hemby, with nice touches from the keyboard. Cheri begins with the first verse and chorus. Poignant vocals from guest vocalist, Marty Roe begin in the 2nd verse as well, creating a lovely duet in the second verse and chorus with Cheri Keaggy. * * * * + + RAIN OR SHINE FRIEND -(Prov. 3:5-6, Romans 8:28, Heb.13:5-6) Wonderful illustration of the Lord's promise; I'll never leave you or forsake you. MUSICAL NOTES: Begins in the introduction, softly with keys, acousitc guitar, and softly playing bass which carries the driving beat in steady eighth notes. Sound then explodes into an irresistible, enthusiastic accompaniment, starting when the drums and slide guitar enter in the second 4 measurres of the introduction. The dotted note pep and drive which cooks throughout the song, propels the musical accompaniment, even when it softens down during the verses. Bass player was hot with his running 8th note beat support throughout the composition. Lively, yet subtle counter melody voices can be heard as well. Vocals are fabulous as well. Reassuring, cheerful and sparkling, Cheri's vocal presentations are sure to cheer up and bolster the listener's attitude, perception of circumstances, internal peace and faith in Jesus! Songs which encourage faith development. * * * * + + STAY TO THE MIDDLE - (Deut. 5:32-33). An appealing testimony about having faith in hard times. Encourages the listener to step out in faith, become centered in prayer, and to be obedient to the still, small voice of the Spirit, knowing that the Lord will give us what we need to withstand any challenge. MUSICAL NOTES: This anthem Intro begins in a short swirl of desonant notes which segue into a solid, resolved, accented major chord. The rest of the introduction establishes the melody and easy, broad 4/4 beat, with full guitar ensemble chordal support, and keyboard voices as well, creating a full sound. Vocals are wonderfully expressive, dynamically bringing the meaning of the lyrical thoughts to life. Dynamics in the musical accompaniment adds much to the feel of this song; being softer in the verses, building in sound in strategic parts of this composition. * * * * + + SPEAK (THE LISTENING SONG) -(Psalm 25:14, Jer. 15:16, James 1:5, Matt:7:7), Also (Psalm 27:14 & 37:7 & 119:105, Isa 55:6, 1 Chron.16:11) Explores taking time to be with the Lord, despite our tendency to be over busy in our secular culture. BRings home the thought of the importance of actually listening to the Lord, instead of just petitioning Him, which is important for our walk with Him. MUSICAL NOTES: Most enjoyable, upbeat, yet poignant prayer hymn, with a serious message so well expressed by heartful vocals, in a dynamic, delightful musical package! Begins with a drum intro, to set the beat, with electrical guitar and keys joining in, during the intro to the melody, and continue onto the verses, providing delightful rhythm and chordal support, with a few subtle counter melodies in sections. Verses begin softly, in both the vocals and accompaniment and dynamically grow in sound. Adore the Chorus, with its statement of faith and truth so strongly expressed in the lead vocals and back-up vocals, supported with a solid, broad and dynamic musical accompaniment, a combination which chokes up this reviewer every time! * * * * + YOU'LL ALWAYS BE MY SON -(Luke 11:9, 1 Peter 5:7, Romans 8:26, 1 Thess.5:17, Col. 1:19) Ballad begins with a mother's never-ending love and prayers for her growing son; as a boy, as a young man and as a married young adult with a family of his own. It is hard to see a beloved child, no matter how old, go through trials and tribulations, though prayer is a stabilizing force through it all, the good and the bad. The lyrics imagine what Jesus' Mother, Mary thought and prayed about as she stood by and had to watch her son, Jesus die on the cross. Be sure to have a box of Kleenex nearby, if you are sensitive to poignant musical packages! MUSICAL NOTES: Another memorable piano, and strings ballad with flute, oboe and clarinet voices, creating a moving melody which is perfect for the heart-felt lyrics so well expressed by Cheri Keaggy. Piano and woodwind/strings ensemble work together to provide a solid musical accompaniment in a most dynamic fashion. Vocals are real, and express on a deep level the prayers of every parent for their growing children. The lyrical story told about Jesus' mother, Mary reflects the struggles of parents when something has gone terribly wrong with their children, and they turn to God and ask, "Why?" Musical accompaniment is very touching during this part of the song, with piano, strings and flute adding a beautiful musical support. * * * * + + RESTORED: The Grindstone Song:-(1 Peter 5:10, ISA. 45:3, PS. 68:3) Through life's annoyances and dark storms, the Lord will stand by us through it all, as we depend on Him, Jesus. This a message to remember and hang on to during the inevitable troubles we all face sooner or later. MUSICAL NOTES: A glorious 6/8 meter piano and string ensemble anthem of testimony, with an infectious, catchy melody, wonderful, comforting vocals and my favorite lyrics of this album. The piano propels the composition's momentum, driving spirit and energy, establishing the 6/8 swing feel while offering both melody support and counter-melody within this composition. The string ensemble also provides chordal support and counter melody as well. The mixing of the piano and string ensemble tracks were perfectly done, creating the perfect accompaniment and support for Cheri's uplifting and encouraging vocal performance and memorable melody. The lyrics express so well the process and opportunity to develop our faith and grow closer to Jesus in difficult times. I have listed the complete lyrics. * * * * TELL ME AGAIN ABOUT HEAVEN (2nd Cor. 5:1-9, 1 Thess. 4:16-18) Despite the troubles and problems of this world, believers can look forward to going home to be with the Lord in a wonderful place of peace. MUSICAL NOTES: A 3/4 meter, driving, flowing song of hope, with a swirling musical sound of anticipation, propelled by slide guitars, piano and the magic of an electric keyboard. Vocals are inspiring, and whistfully look forward to this event, leaving all the troubles, pain and tragedy expereinced in this life, and going home to our Lord in a place of light and peace, leaving pain, sin, troubles, tears behind in this world. * * * * + + THE REASON I STAND TALL (Phil. 2:13, 4:6-7,13, John 15:6, 1 Cor. 1:8-9 & 15:56,1 Samuel 16:7) -We were made unique, with special purposes in mind by the Lord, who will give us all the support we need to follow his lead and use our gifts to glorify Him. We need Jesus to keep us on track and focused. MUSICAL NOTES: Another beautiful, dynamic piano ballad prayer hymn, with a poignant melody and a heart-felt, tender spirit, which fully supports the expressive vocals, and the song's spiritual message which testifies for our need for our Savior, Jesus. Musical accompaniment is a wonderful mix of expressive piano, played by Cheri, and highlights and chordal support from electric keyboard, by the talented Pat Coli. Cheri again delivers a vocal presentation which truly reveals her faith and her talent! * * * * + + THIS IS THE LOVE (Romans 3:23 & 7:14-25, John 10:27-30) The Lord loves us, cares about us even when we fail Him. He can change our hearts and minds. MUSICAL NOTES: Another lovely prayer anthem with a stirring, memorable melody and meaningful lyrics, wonderfully brought to life by expressive vocals and well done piano, guitar, drums and strings in a staight 4/4 beat accompaniment. Very nice dynamic buildup in the verses, leading into the chorus. Supportive, well-written counter melodies support the melody and rhythm of the composition. Phil Keaggy offers a soaring electric guitar solo in the interlude, and in the ending measures. Lead Vocals and backup chordal support are most effective in expressing the spirit and spirtual message of this strong anthem of faith, worship and thanksgiving. * * * * + CROSS OF CHRIST - (John 3:16, Romans 5:8-11, Col.2:13-15, Heb. 7:27) - We have hope despite our failings as human beings because Jesus loved us so much that he was willing to be our sin offering on the cross. MUSICAL NOTES:Contemporary sound comes together with a touch of blues and elements of Gospel in this 3/4 meter, flowing powerful anthem, with great dynamics and a memorable, dynamic melody. After a strong intro of an ensemble of piano, edgy electrical guitar & keys, song begins softly in a minor key in the verses, which lists life's problems, failings and mistakes we make as human beings, but segues into a major key at the chorus, which is joyous and filled with gratitude for the cross of Christ. Piano, electric guitar and keys create a solid, accompaniment with some edge and spirit. Vocals and back up vocal full harmonies have the qualities of the heart of Gospel, especially during the build-up in the Bridge into the up a step modulation, found in the last time through the chorus. * * * * + BRING IT ALL IN (Ps. 7:16-17b, Matt. 11:28-30, John 14:17) Ballad begins in describing a man who has hit rock bottom, described as "dragging his feet, And the look in his eyes was the look of defeat and despair." Man is invited to bring it all in to the feet of Jesus, and be comforted by His grace. MUSICAL NOTES: Another beautiful piano ballad, composed in a slow, 3/4 meter, which gives the song a flowing, peaceful quality. Cheri's faith flows through her vocal presentations, which are paired with truly uplifting musical accompaniment; a combination of well-played piano, slide guitars and bass, and light percussion which comes in at the 2nd verse. Song is peaceful and comforting, the perfect musical invitation to accept Jesus as Lord and Savior. Again, I love the Chorus and the Bridge, which has some interesting chord modulations which supports the wonderful message of the good news found in Jesus. Sound climax is the Chorus and Bridge, sung with feeling and conviction saying it all in such a meaningful way. LYRICAL SAMPLE: CHORUS 2: Come in - Bring it all in, We've got a place for you / There's enough grace for you / Turn around, lay it all down/bring all your heaviness/ Let Jesus carry it / God only knows where you've been/Bring it all in. website. I just listened to that song "Beyond Beautiful" you gave me some time ago! Thank you Kathy for the encouragement!